Constructed from durable aspen wood traditional adirondack design sculpted seat keeps tots in correct position. Sliding tray offers additional security and seat belt keeps child secure. Zip tie locks the rope around a limb or hook. Recommended for children 35 lbs. and less Kiddie Collection is designed for children 1-4 years of age For added strength - glue, bolts, screws, and dowel construction Easy to maintain - clean with soap and water Natural unstained or painted finish available. Rope instead of chain prevents catching. Made in the USA. Requires minor assembly. Seat belt included, ten foot rope included. 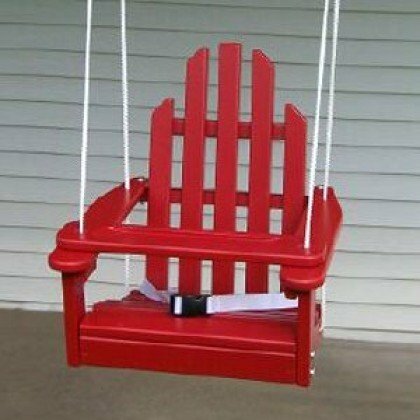 If you have any questions about this product by Kids Outdoor Porch Swing, contact us by completing and submitting the form below. If you are looking for a specif part number, please include it with your message.